When I was given it, I was told it translated as Cheerful Piper, in reference to my relentless cheer and the fact that I play bagpipes (never mind that “Piper” would have referred to the bird, not the musician). I cannot wear this name with pride, because it was stolen. Had I been given this name by a local Native American tribe, it would be one of the few events in my life of which I am very proud. Instead, this was given to me by a bunch of white, middle-aged men and the youth they led in the Boy Scouts of America. This racist tradition is part of the Order of the Arrow, the BSA’s “honor” society (quotes are mine, to mock the idea that the O.A. is honorable). I sincerely hope that this racism doesn’t surprise you and does offend you. I hope that it doesn’t surprise you because I like to imagine that most of this country already knows what I am about to say. However, I suspect that is not the case, hence the impetus for this post. To give a bit of background: the O.A. operates in many ways like a fraternity, particularly with regards to induction rituals (minus any institutionalized hazing). These induction rituals are performed by boys in Native American costumes, which are in almost every case historically inaccurate (to put it mildly). The claim, both implicitly and explicitly is that these inductions take their origin from Native American traditions. Ironically enough, one of the things a ceremonialist is instructed to do is research how to be respectful of Native Americans’ cultures. One of the blogs I stumbled across in that research is Native Appropriations. And the more I read, the more unsettled I was, until I eventually quit the BSA entirely (this racism was a major factor, as was the LGBTQ-phobia, sexism, and religious discrimination). 1) The induction involves several vision quests, followed by a naming ceremony, where a name is appropriated from a native language. This name is sometimes taken from a local language, but is frequently taken from Lenni-Lenape, regardless of the geographical location of the induction. 3) Almost everything said in the ceremony plays into the idea that Native Americans have a mystical and magical connection to the earth, an idea Hollywood loves to perpetuate, and a gross misrepresentation of actual Native American religious traditions. I’ve tried pointing some of these things out to several leaders of the local O.A. organization. When these people bother acknowledging my concerns, they give two defenses of this racism. The first is that there are some people working to change “ceremony culture” to be more historically accurate and more appropriately represent Native American culture. The second one is that there is an organization called the American Indian Scouting Association (ASIA) that supposedly reviews and approves of the ceremonies. However, I have yet to find any evidence that this is true. Most media attention given to the BSA today focuses on homophobia. However, the problems with the BSA don’t stem from just one misguided view. There are several unacceptable policies that the BSA has that are a result of the privileged nature of its members (being almost exclusively white, christian, of middle and upper class, and cisgender males). What is bothersome about the focus on the homophobia is that it paints not just an incomplete, but ignorant view of the BSA’s problematic policies. Homophobia in the BSA is not something that needs my voice. But the racist, sexist, LBTQ-phobic, and christian-focused policies and culture of the BSA doesn’t have much of an opposition. I’m merely in a position to be able to argue in detail about the BSA’s cultural appropriations of Native Americans. The thing that makes this racism so dangerous is the same thing that makes the OA so appealing: the mystery. In order to make the OA a more attractive organization, the induction process is shrouded in mystery (even though it is not technically a secret). I hope in this post and future posts to be able to turn the spotlight on these issues and cut through the shroud of mystery. And, if you are a Scout reading this post, I ask you: Do you want to be a part of an organization that cannot be trusted to treat each person equally, who isn’t loyal enough to their own oath and law to correct their privilege, who isn’t a friend to those marginalized by oppression, who doesn’t have the courtesy to respect their traditions, who isn’t brave enough to challenge their own preconceptions, and isn’t reverent of everyone’s religious beliefs? If you’ve ever wondered what religious and spiritual traditions on one hand, and the social sciences on the other, have to say about each other—how do the sciences inform religious practice? how does a spiritual outlook inform research? are they mutually reinforcing? are they in tension?—then come forth and participate in the exchange! We’ll have plenty of time for questions from attendees. 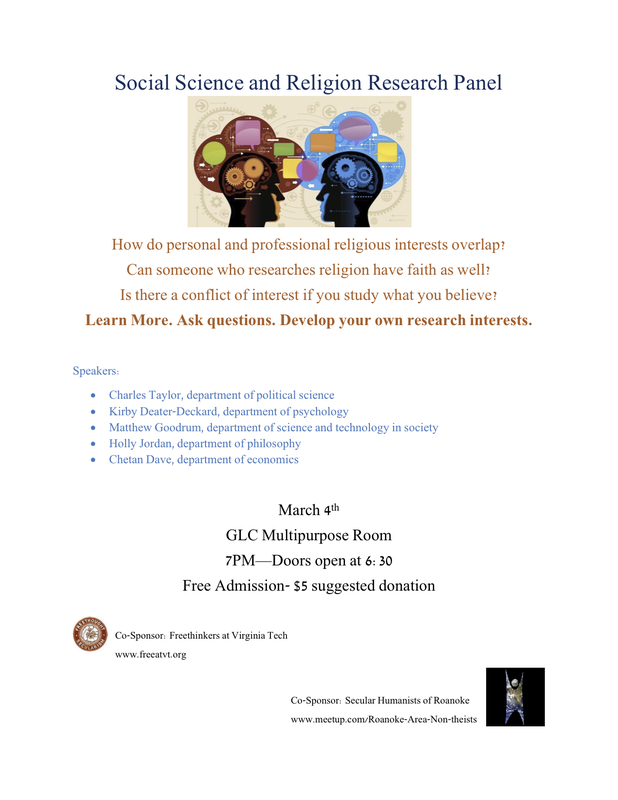 This event was inspired by the Viewpoints on Science and Religion Panel.